Home » What StarCraft II Class are you? 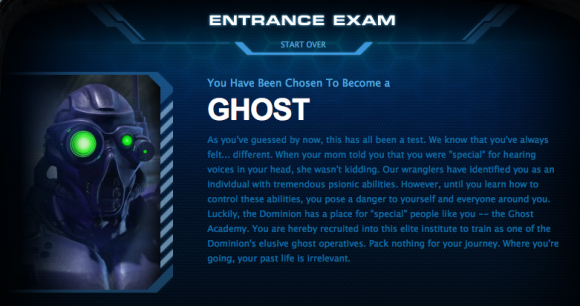 In light of StarCraft II: Wings of Liberty‘s imminent launch this July 27, Blizzard has created the Entrance Exam for the Dominion. Welcome to the Dominion New Recruit Processing and Acclimation Center. Prepare to take the Entrance Exam. The purpose of this test is to determine your placement within the Dominion military by gauging your reaction and adaptation to stressful situations. Please answer truthfully. Following this test you’ll be assigned to a specific squad or unit and given instruction on when and where to report for active duty. Good luck, recruit. Serve your Emperor proudly. Take the exam right here. IMPORTANT NOTE: Yes, it’s just an advertising ploy from Blizzard, but a brilliant one at that.